If you are contemplating an office renovation to provide a more modern office layout, the range of cost is important to consider. The potential renovation costs are determined by the size, square footage, and the scope of the work. We will like to provide a guide to assist in your decision-making. 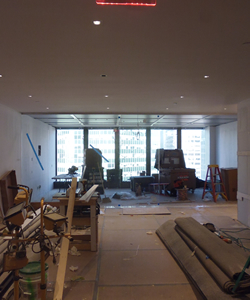 Are you renovating an office space or constructing a new office space in New York City? The right commercial contractor is indispensable to the process of renovating or constructing your office space. There are many reasons for a company to renovate, upgrade, or construct their office space. Other companies are looking to modernize existing layouts or expand the office size. Other reasons for renovation are meeting new building code and operations standards, as well as, improving overall productivity levels. The spectrum of office construction projects vary from complete renovation to remodeling of specific areas. Our brokers would be happy to be a contact and guide for all your office-remodeling needs. A move-in ready office is a good choice when a company is leasing less than 10,000 square feet. Move-in ready spaces are helpful to tenants with short-term leases. Short-term leases have less advantage to negotiate for improvement allowances. For companies with a long-term lease, improvement allowances are usually a better choice. Now for the real question, how much will it cost? In this case, the answer is not easy. Cost for a renovation vary in different markets. A “shell” office space, usually in a new building, will be more expensive than a space with a build-out. A second-generation building will have finishes that can be used such as ceilings, doors, and finishes. If you want above standard finishes, this will cost more money per square foot. 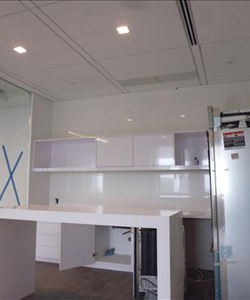 A specialty build-out for medical offices or lab spaces will be more expensive than a standard office build-out. Another cost is hiring union labor which is required in some buildings. Regardless of the type of improvements we can help you calculate and figure out the cost and details involved towards renovaating an office - give us a call today at no obligation!